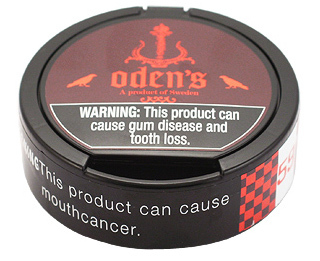 Ive never been really excited to try Odens Snus. I remember a few months ago when Northerner had shipping problems and I could not get any Roda Lacket, I drove an hour east to a tobacconist who had snus, hoping to get some of my old favorites to tide me over till I could order from northerner again. All he had was general loose and Odens. I brought 8 cans of general and 1 can of Odens. I didn’t like general portions so I knew I wasn’t going to like the los version either. To my surprise it grew on me and now I get a few cans it as part of my monthly order. As for the odens, I threw it out when I got my order of Roda lacket. Now I have been given the chance to try it again and this time I will not be so discerning. On first sight I was really impressed by the packaging. 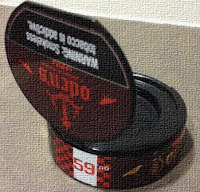 A stylish good quality black can with an attached lid and bright attractive label.I opened the can and took a sniff. There were no distinguishable features or scents, just a subtle tobacco smell and a jet black moist product.I began packing it into my ice tool and it formed into a nice pris. The high moisture content and smooth grind make it easy and ideal for hand baking or icetools. I formed several sizes from large to small and all stayed together easily and did not fall apart in the hand or the mouth. Being 22mg nicotine, this is quite high even for a strong snus. I did not notice any surge in nicotine, the strength seemed perfect and the good thing about los, if it is too strong, you can make very small pris’s according to your preferences. I made my regular 3-4cm portion and it was fine.There was really nothing eventful about the taste. It’s supposed to have a cinnamon flavor. I cannot detect any cinnamon or other flavorings, just straight tobacco and salt. It doesn’t please or displease me, its just snus in my mouth doing its job of dispensing nicotine into my bloodstream.I like mine with a flavor so this was kind of disappointing. This snus is on the other hand PERFECT for beginners. If you have never tried los and would like to, this is the snus for you! Super easy to mold and form, non-threatening in flavor or texture and a good strong nicotine hit. If you are new to loose give it a try and think of it as a stepping stone to others, stronger in flavor and harder to form. 1 comment on "Oden's Extreme 59 Loose review"
I had the same consensus with Oden's Kanel- just tasted Tobacco with a very very mild aftertaste of cinnamon.